Rainy, gloomy, and damp, today is just a Chicken Soup kind of fall day. 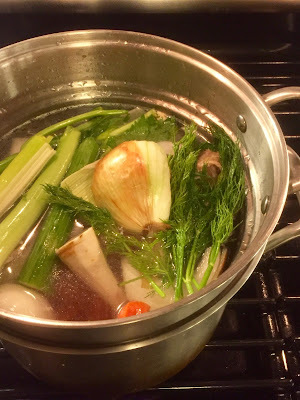 Of course, the first step to any great soup is a well developed stock, and if you've got some leftover Chicken and nothing better going on for a few hours, making it is from scratch is both wonderfully easy and very worthwhile. Now, keep in mind, you can certainly put your own stamp on Stock (it's very hard to mess up and the longer you simmer it, the more the flavors will intensify), but it you're looking for a good basic method, the below recipe works very well and always seems to deliver a tasty result. Method:Add all the ingredients into a very large pasta or cast iron pot (ideally with a strainer basket inside to easily remove the large solids). Cover with Water and bring to a boil over high heat. Lower to a simmer and cook uncovered for about 4 hours (skim foam from the top periodically if you can). When finished, let it cool and strain it all using a colander until all solids are removed. I like to finish it with a squeeze of Lemon Juice. Use the Stock to make your favorite Chicken or Chicken Noodle Soup! (Cook's Note: for a very simple, improvised Chicken Soup, I just saute some chopped yellow Onion, Carrot and Celery and add chopped cooked Chicken, Stock, and some cooked Barley or small Pasta. Greens like Parsley, Dill or Thyme would be a welcome addition -- add Salt and Pepper only as needed, serve and enjoy!). Tip - Use extra Carrots, Onions and Leeks you may have bought to make our favorite Turkey Mushroom Meatloaf!